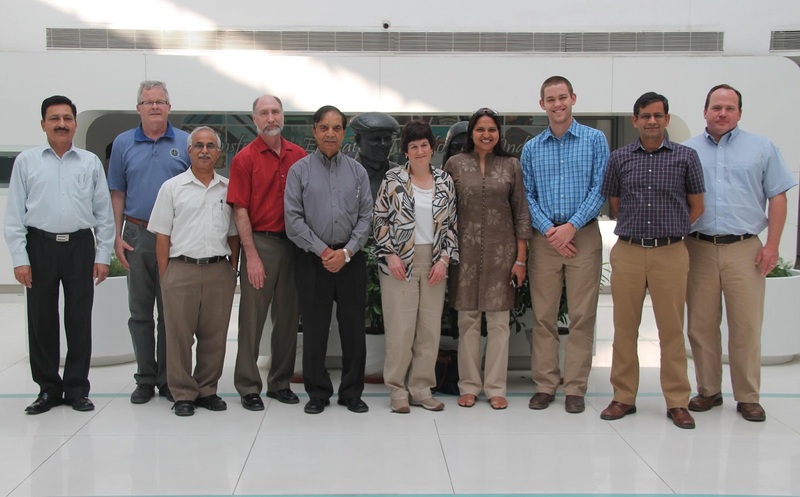 Jalandhar: A Seven-member delegation from the flag-ship Purdue University Indiana of the six-campus Purdue University system of USA visited LPU, today, to seek possibilities for Joint Research and other collaborative study programmes. The delegation met and interacted with Vice-Chancellor Dr Ramesh Kanwar, deans, directors, heads, faculty and students of various departments of LPU. The visiting members gave presentations on collaborative opportunities and different aspects of agriculture, especially climate resilient agriculture, excellence in global agriculture, water availability, bio-energy production and plant breeding. The delegation led by Dr Kashchandra G. Raghothama, Associate Director, International Programmes in Agriculture, comprised other members Dr Karen Irene Plaut, Associate Dean and Director of Agricultural Research; Dr Joe Michael Anderson, Head, Department of Agronomy; Dr Mitchell Reed Tuinstra, Department of Plant Breeding; Dr Charles Peter Wolushuk, Department of Botany and Plant Pathology; Dr Indrajeet Chaubey, Department of Agricultural and Biological Engineering; and, Dr Alexander Lewis Renaud, Department of Agronomy. Apart from all these, people spread their New Year pleasure by updating their social networking accounts and messaging applications like Whatsapp with happy New Year Whatsapp status messages.